Hello all! I have another Anime Food Re-creation here. In the same episode that Ichigo creates an apple birthday cake for Ringo in Yumeiro Patissiere, she also has a tray of decorated sugar and gingerbread cookies. 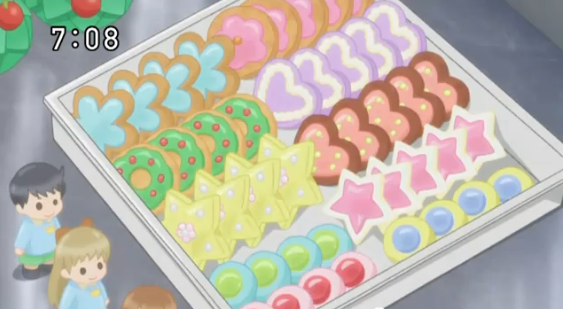 Ichigo ends up using these cookies to decorate the top of a gingerbread house when she has to redesign her cake. 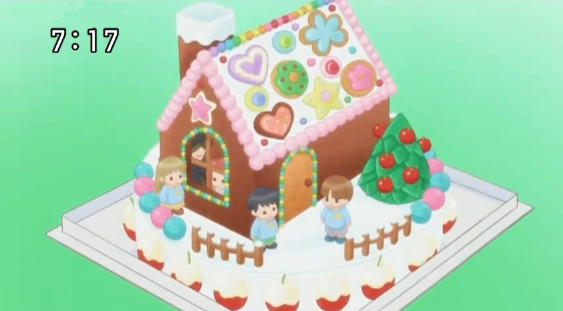 You can check out the Anime Food Re-creation of the gingerbread house by clicking here. As for my tray of cookies, check these out! House: The house itself was actually from a prebaked gingerbread house kit I got from Walmart. It didn't come with a chimney so I baked my own along with the cookies and "installed" that element. Roof: The rainbow at the top of the roof was made with Sixlets, while the pink border was made with M&Ms. I covered the roof with icing (which was included in the gingerbread house kit) and attached the cookies and Sixlet accents. Chimney: To get the snow on top of the chimney, I added milk to some of the icing to loosen it up. I then spooned it on top of the chimney and let it drip down. It's important to add the milk in tiny increments until you get the proper consistency. You don't want it to be too thick because it won't drip and you don't want it too loose because it will flow too much down the chimney. As a rough gauge, when you spoon and drop a drop of icing into the bowl, it should take about 8-10 seconds to "melt" back into the rest of the icing. Window: The window was made just like the door. I used pretzel rods to make the grid pattern. People: I don't have the skill or patience to make little fondant people so I used white chocolate and my Hello Kitty ice cube tray to make white chocolate figures. When they solidified, I used a toothpick to carefully cover the clothing area with icing. I then added some blue sanding sugar to add some color for the clothes. I also used melted chocolate to make the eyes. Tree: To make the tree, I first made a parchment paper cone and stuffed it with extra parchment paper to make it sturdier. I placed gingerbread around the cone and baked it with the rest of the cookies. To make the leaves, I flattened some green gumdrop stars and cut out diamond wedges. When the cookie was cool, I covered the tree with green icing and adhered the candy wedges. When that was hardened and dry, I added the red Sixlets for the apples. Wooden Fence: To make the wooden fence, I stuck pretzel rods in a marshmallow base and used icing to adhere them all together. Gumball Fence: The gumball fence was made with blue and pink gumballs on the same marshmallow base as the wooden fence. Apple Border: The apple border was made with large red gumballs dipped in icing. To make them more stable and not roll around, I shaved off a little bit of the gumballs so there was a flat bottom surface. I stuck a toothpick through the gum part and then dipped them in the loosened icing and then added green Airhead stems before the icing dried. So there you go! All the different elements of my Yumeiro Patissiere gingerbread house. It took me several days to complete and cost about $30 to make with all the different candies. Pretty crazy... kinda stressful... but loads of fun! I hope everyone has an Extraordinary Merry Christmas! Merry Christmas, everyone! I hope you guys are all having a wonder holiday season! In the spirit of the holiday, I'm posting my re-creation of Yumeiro Patissiere's gingerbread house! In this episode, Ichigo had to redesign her apple birthday cake for Ringo in an hour. How she was able to complete this in an hour is beyond me! I completed my gingerbread house over the course of a few days. These kids must possess incredible skill! Here's my gingerbread house inspired by the one Ichigo created! Merry Christmas-Eve Eve! This Christmas season, I decided to have an Baking Adventure with Gingy Gingerbread Cookies! 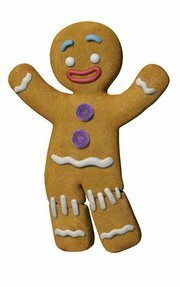 If you're looking for a tutorial on how to make Gingy, you have to check out Diamonds for Dessert's blog. She does such an amazing job! I love her attention to detail! I wouldn't have been able to make these as successfully if it weren't for her helpful tips and detailed guide. For my Gingys (Gingies? ), I used the Thin, Crisp Gingerbread Cookies recipe from Cook's Illustrated and the Sugar Cookie Icing recipe found on allrecipes.com. 1. I didn't roll out my dough as thin and didn't bake them as long as the recipe stated. As a result, my cookies were more thick and soft than crispy, but I was okay with that. 2. The cookie recipe had too much ginger for me taste. If I use this recipe again, I'm going to cut down on the ground ginger. 3. I also noticed that the Gingys expanded in the oven so when you are forming them, you need to make him skinnier than you want him to be. Then he puffs up into the perfect size. My first batch ended up looking like little marshmallow men. 4. Finally, instead of using a piping bag for the icing, I used a Food Drawing Pen that I got from Daiso. It was only about $2 and has an exchangeable tip for different widths of writing. I was really happy with how my Gingys turned out! My friends and family enjoyed torturing eating them. (Those monsters! Haha!) But seeing them enjoy the food I make is really the best compliment. I hope you all have a warm, sweet, love-filled happy holiday season! My mom's been requesting oatmeal cookies since my aunt gave us a huge Costco-sized bag of old fashioned oats. After looking around for a good recipe, I decided to just try the Vanishing Oatmeal Raisin Cookies recipe under the lid of the Quaker oatmeal container. Since we didn't have raisins and my parents don't like super sweet cookies, I made a few modifications to the recipe. Well... those modifications resulted in a total oatmeal cookie FAIL! My cookies didn't spread at all! They looked like... well, little rocks! That's when I realized this wasn't a fail... It was a total WIN! I had inadvertently made my own version of Hagrid's Rock Cakes from Harry Potter!! Combine flour, baking soda, cinnamon, nutmeg, and salt in a small bowl and mix well. In a large bowl, beat butter, oil, and sugars on medium speed of electric mixer until creamy. Add combined flour mixture; mix well. Add oats and craisins; mix well. Cover cookie dough with plastic wrap and refrigerate overnight. Drop dough by rounded tablespoonfuls onto parchment paper-lined cookie sheets. Cool 1 minute on cookie sheets. Cool completely before storing tightly covered. Hey all! 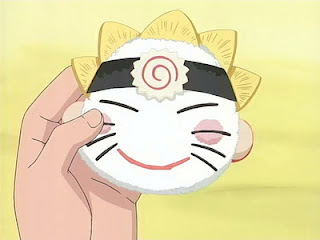 I have another Anime Food Re-creation for you! Today is the Naruto onigiri (or riceball) that Hinata makes for Naruto! Happy Day-After-Thanksgiving and Black Friday! 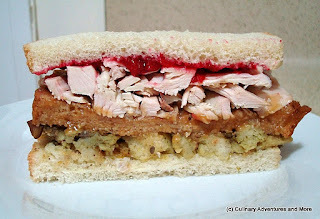 In honor of the unofficial Eating Leftovers Day, I decided to make Ross's "Moist Maker" Turkey Sandwich from FRIENDS! According to Ross, the secret to Monica's turkey sandwiches is an extra slice of gravy-soaked bread in the middle, which he called the "Moist Maker." He didn't specify what else was in the sandwich so it's pretty much up to your own creative license. 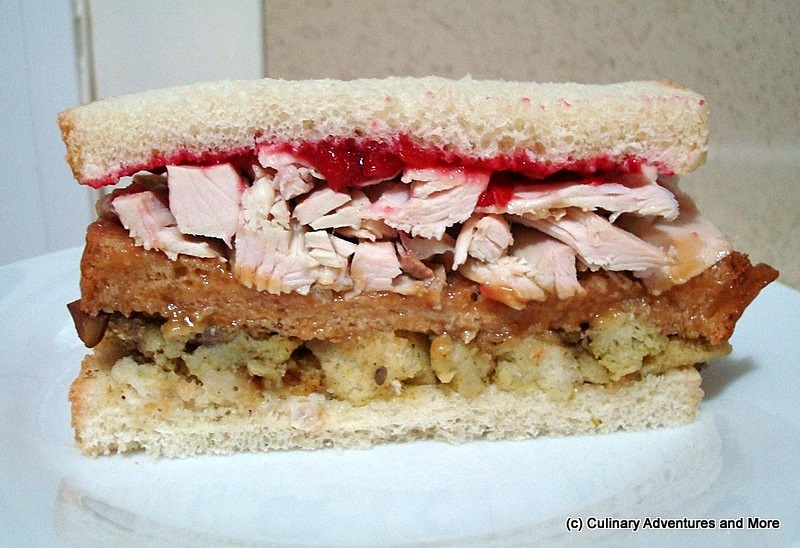 I used Food Wishes' cranbango (cranberry mango) sauce (though I omitted the spices), shredded turkey breast, the Moist Maker, and cornbread chestnut dressing between two slices of Country White bread. I liked the taste of the sandwich with the cranbango sauce, but thought this version was too carb heavy. Two slices of bread plus the Moist Maker AND dressing was overkill. I should've thrown in some romaine lettuce and smoked gouda to change up the flavors and texture. Oh, well... live and learn! The most memorable thing about this sandwich was seeing Ross freak out when someone at work ate his sandwich. Hilarious! If you'd like to see Ross's "MY sandwich" clip, check it out below. It's not everyday you get to eat the food of video games... made by the creators of the game... for free. So in honor of today's release of The Elder Scrolls V: Skyrim, I present to you: The Skyrim Food Truck! To promote the game, the creators offered a sampling of Skyrim's delicacies: Dragon Leg (Turkey Leg), Whiterun Corn (Corn on the Cob), and Solitude Sweetroll (Roll). And here's what it looked like! To be honest, the food wasn't all that interesting. It was actually quite bland, but I will admit, free food is a very effective promotional tool. I, personally, have never played any games from The Elder Scrolls series, but the food truck got me looking into the game and talking to my friends about it. Along with the free food, promoters also passed out drink cozies and magnetic bottle openers. I was actually most impressed by the custom take-out box. Who needs a happy face telling you to "Have a Good Day!" when you can have your game title there? They also had custom napkins but they weren't nearly as impressive as the box. As I sat there eating away at the "Dragon Leg," I couldn't help wondering... Why can't more video game promotions be like this!? I mean - who wouldn't want to take a bite out of a 1-UP Mushroom or taste how spicy the Superspicy Curry really is? And just imagine the possibilities with a game like Cooking Mama! The Skyrim creators were definitely onto something. Prior to seeing the food truck, I didn't even know The Elder Scrolls existed. But look at me now! Here I am blogging about it! Some time last year, I went through a slight Miyazaki/Ghibli movie marathon and when I was going through Anna the Red's blog, I saw that she had actually recreated some of the Ghibli food from the movies! I really admire Anna the Red's bento (and non-bento) work. It is AMAZING to say the least! Definitely go check her out! 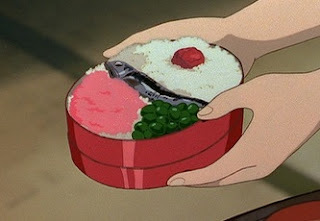 This is the bento that Satsuki (Mei's older sister) makes for Mei in the anime movie My Neighbor Totoro. After seeing Anna the Red's tutorial for Mei's bento, I was inspired to recreate my own. Did you know McDonald's offered baked Strawberry Pie?! I sure didn't! When I stumbled across this at my local McDonald's, I knew I had to give it a try. I love strawberries! But honestly though, I was a little wary. I really like McDonald's Apple Pie, but I never liked the Cherry Pie and my experience with the Taro Pie was less than favorable. The outer crust of the Strawberry Pie was the same flaky crust found around the Apple Pie but minus the cinnamon sugar. The strawberry filling really reminded me of the jelly you'd find in a donut. There were very small chunks of strawberries, but the strawberry flavor was lacking. Surprisingly, it wasn't that sweet. I was actually expecting an overly sweet strawberry jam-like filling, but instead I got a reddish, slightly sweet jelly goo. Interesting, but I wouldn't order it again. I'll be sticking to the Apple Pie I know and love. Last week was Navy Week in Los Angeles. For a few days, the Navy allowed civilians to board and tour the USS Abraham Lincoln aircraft carrier. Seeing as this was a very rare opportunity (and the fact that an aircraft carrier hasn't been docked in the Port of Los Angeles in 20 years! ), I was really eager to go! But as you can imagine, I wasn't the only one! THOUSANDS upon THOUSANDS of people descended upon the harbor! It was so crazy that there was a 2.5-HOUR WAIT! Just to board the shuttle bus that takes you to the area where the carrier was docked! ...the USS Abraham Lincoln! Isn't she breath-taking? Inside, they had various stations and displays showing some of the equipment used aboard the aircraft carrier. We got to see some of the rescue equipment and even try on the firefighting suits and helmets! One of the highlights was actually getting to ride the large platform elevator! You're probably thinking, "Elevator? What's so great about that?" Here is my re-creation of Tohru's platter of onigiri! Aloha, everyone! I've had my eye on the Get Shaved truck since coming back from my trip to Hawaii almost a year ago! While on the North Shore, I had some of the best Hawaiian shave ice from Matsumoto Shave Ice so I was eager to find something comparable back on the mainland. What sets Hawaiian shave ice apart for a typical snow cone is Hawaiian shave ice's powdery snow-like texture. The addition of ice cream and azuki beans (sweetened red beans) makes it almost magical - truly one of the best ways to cool down on a hot summer day! The other day, while running some errands, I saw the Get Shaved truck parked along the side of the road and quickly pulled over. I remembered scrolling through the menu online and thinking, "Hm... the PassioNut combo sounds pretty good," so that's what I ordered. This is the Medium size with Macadamia Nut ice cream. The PassioNut came with Lilikoi (passionfruit), Coconut, and Melona (Korean honeydew creamsicle) flavored syrups. I like sweets as much as the next person, but I found that the syrups were way too sweet for my taste. The Melona-flavored syrup also had an artificial-ness to it and didn't mimic the actual creamsicle flavor at all, which was disappointing because I really like Melonas. (They're found in many Asian, particularly Korean, supermarkets if you want to give them a try.) The Macadamia Nut ice cream was delicious though. The creaminess somehow helped mellow out the sweetness. You have the option of adding the Li Hing Mui powder, which is this slightly sweet, sour plum powder. I got it on the side and tried a small bite with the powder in the car, but forgot to add it when I got home. I thought it was an interesting mix with the sourness helping to balance out the sweetness, but it's definitely an acquired taste. Even though PassioNut wasn't my ideal mix, I wanted to try one of the Get Shaved truck's original shave ices before creating a custom mix. Next time I catch the Get Shave truck though, I'm going to try the combo of flavors I fell in love with at Matsumoto Shave Ice - Lilikoi, Guava, and Mango flavored syrups with ice cream and azuki beans. I can't wait to see if I can really get a taste of the islands closer to home! Umami Burger is another popular LA burger spot that's based on the fifth taste - umami. For those who don't know, umami is supposed to be that meaty, msg-like flavor you taste from... well, meat. After some shopping around 3rd Street Promenade, we decided to stop here for dinner. This particular location is attached to a Fred Segal and although the address says Umami Burger is on Broadway, the entrance is actually around the corner on 5th Street. The restaurant + bar is really small so we had to wait about 20 minutes for a table, but we just killed time talking and looking at the menu. Our table also ordered some sides - splitting an order of Tempura Onion Rings and Sweet Potato Fries. As the name suggests, the onion rings were tempura-battered, which made them really light and crispy. The sweet potato fries were fried to perfection - with just the right amount of softness inside and crispness outside. So often, I've have sweet potato fries that were either soggy or dried out or tasted burnt, but I was not disappointed in these fries at Umami Burger. Each of our sides came with a choice of dipping sauce, but we forgot to select one when we ordered. We later found out that they came with Umami ketchup by default. Honestly, I thought the ketchup tasted like sweetened tomato sauce and it really wasn't my thing. I actually preferred eating the onion rings and sweet potato fries without the ketchup since I thought (once again) it overpowered the flavor of them. As a note about the portions at Umami Burger, one of my friends looked on Yelp and found that people were complaining that the burgers and sides were too small - with some people even going as far as saying you should order two burgers or else you won't be full! With that in mind, I was expecting the burgers to be the size of sliders, but it actually came out as a decently-sized burger comparable to an In-n-Out burger. I almost felt that the people who said you'd need to eat 2 burgers were probably used to the super-sized "6 Dollar Burgers" from Carls, Jr. or some other massive obesity-inducing burger calorie bomb. The sides seemed a little on the small side to me, but we were paying for the quality of ingredients so we were okay with it. People in my party ranged from little Asian girl to rather hefty, well-built guys and we were all satisfied at the end.